Steve Carr’s first collection of short stories is fantastic. His work is intense, reaching into the reader’s head and twisting emotions, shattering logic and reason. The first story Tenderloin is—pun intended—a punch in the gut, as the reader sees the grittiness of the setting and feels the coiled tension in the main character, a veteran of the Iraq War. With journalistic expertise, Carr displays monstrous humanity in a brevity of words, as in The Saguaro Two Step, in which the woman wins the loot in the end, and exposes desperation, as in The Festival of The Cull, wherein Shamina can no longer vote on who is to be terminated. Reality bends as one ventures further into the book, as in the self-explanatory The Girl in a Mason Jar, gets fishy in Strange Water, and disappears in When Wizards Sing, where animals and men blend. The stories are diverse, with main characters of various genders, sexual orientations, ages, cultures, and even species. The book ends with stories of the afterlife on a never-ending train ride for incorrigibles, a man’s struggle for gravity, and the misplaced hope of a senior citizen. Definitely a must-read! Follow Steve on Facebook and Twitter. 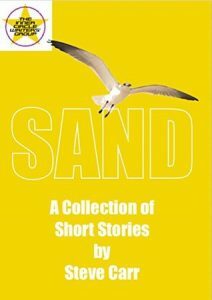 Purchase Sand at Lulu.com or Amazon.com.